Steve Ruck has spent nearly 30 years in the cycling industry as a store owner, a franchisor, a nationally-regarded fitter, a community activist, a philanthropist and a competitive rider. Mr. Ruck founded Bike Doctor in 1988 in Arnold, Maryland. The original Bike Doctor Arnold store, now 28 years old, is a community anchor for cyclists young and old. In addition, Mr. Ruck’s experience and skill as a bike fitter have earned Bike Doctor Arnold the reputation of a top regional destination for performance bike fitting. Not long after Bike Doctor’s original location opened, there was great demand for brand expansion in Maryland, which led to the founding of Bike Doctor Franchise Corporation in 1992. 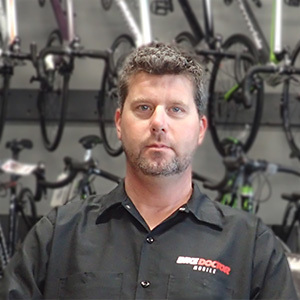 In addition to owning and operating his own 4 Bike Doctor locations, Bike Doctor currently has 3 franchised stores. Mr. Ruck has mentored numerous employees throughout his career, many of whom have gone on to successfully own and operate their own stores and cycling-related businesses. As a franchisor, Steve serves as a coach and an advocate to franchise partners, helping them achieve their business goals. Mr. Ruck is well-known in the cycling industry as a top bicycle retailer, and is consistently recognized by supplier partners as a top-performing dealer. Steve and his team regularly attend special events put on by suppliers for top dealers and provide key input on product. As a competitive cyclist himself for the last 3 decades, Mr. Ruck has raced road and mountain bike races of all distances. In 2014, he partnered with a group of 7 other community leading cyclists from Annapolis and entered the Race Across America (RAAM). Their team, Team Friends Foundation, finished 4th in their division and raised a very substantial sum to support several local charities. Bike Doctor also provided substantial support and resources to the record-setting 2015 Bike Like a Girl RAAM team, which broke the record time for an all-female race crew. Steve is already on a team for the 2017 RAAM. Steve and his Bike Doctor team are well-known to the cycling and triathlon community in and around Maryland. For 28 years, Bike Doctor has provided on-site support and service to events and races- through the original Bike Doctor Mobile vehicle! Both at events and in the stores, Steve increasingly saw a need for “on-demand” bike maintenance and service. His customers, busy professionals juggling work and family demands, wanted more time to ride. Bike Doctor Mobile does just that- allows customers to schedule service when and where it’s most convenient for them. It also offers flexibility and independence for franchisees- something that is very important to Steve as he envisions Bike Doctor Mobile as an excellent business for passionate young cyclists willing to work hard to build their own success, while maintaining a work-life balance that allows for plenty of time on two wheels!